Imagine you are a member of a hospital's executive team, having just left a meeting in which you and other members discussed the possible introduction of an ambitious Computerized Physician Order Entry (CPOE) system. Around the conference table you and others questioned whether CPOE would be the most effective way to realize your hospital's commitment to patient safety. Other issues that were raised included whether clinicians would support or resist the change, whether staff would have sufficient skills, where to begin, affordability and whether to proceed incrementally or with a "big bang." While there was much disagreement with respect to each of the issues, there was near unanimity around two important decisions - CPOE would be implemented and you would be the executive responsible for the system's design and implementation. This article, based on the experiences of a multi-site hospital, and drawing on past research on organizational change, provides a Four-Stage model to help change leaders in healthcare. Although relying on Toronto's University Health Network to illustrate the change model, the model is intended to speak to change leaders implementing various types of complex changes in all healthcare organizations. However much healthcare organizations may resemble - at least on the surface - other large, complex organizations, thoughtful analysis reveals that healthcare organizations are considerably more than mere businesses. Peter Drucker (1993) tells us that healthcare organizations are the most complex form of human organization we have ever attempted to manage. This complexity derives from, among other things, the confluence of professions (e.g., physicians, nurses, pharmacists and administrators) and other stakeholders (e.g., patients and government) often with seemingly incompatible interests, perspectives and time horizons. Exacerbating the challenges for healthcare leaders is the well-known need to satisfy what appears to be the insatiable demand for healthcare - without unlimited financial support. With these challenges in mind, this article attempts to lay out a research-based model of how to lead change in healthcare organizations. It uses the implementation of a CPOE system - specifically, Medication Order Entry/Medication Administration Record (MOE/MAR) at Toronto's University Health Network (UHN) - as an ongoing case. In addition to the UHN case, which was largely successful but not without some bumps along the road, additional evidence is drawn from the vast literature on change management.1 Though this article will use the change at UHN for illustrative purposes, its intended audience includes all healthcare managers, from the most junior to the most senior, in search of a systematic approach to creating order during complex change. MOE/MAR is UHN's major patient safety initiative, enabled by computerized medication order entry and medication administration. By supporting clinical decision-making that is consistent with hospital policy and evidence-based practice, MOE/ MAR is intended to decrease adverse events related to medication error. In addition, MOE/MAR provides a rich data set to monitor and improve operational performance. MOE/MAR was designed to operate at multiple UHN hospitals, across diverse inpatient services, including General Internal Medicine, General Surgery, Emergency and Cardiology. Initial planning for MOE/MAR began in 2001, went live across divisions from 2004 to 2006 and has cost UHN approximately $5 million. Gale (2005) reports that only 2% of North American hospitals have greater than 50% computerized medication order entry utilization rates. As of July 2006, UHN's utilization rate was over 85%. As in all industries, change management is complex (i.e., there are many interdependent processes and variables); it is difficult to fully lay out a comprehensive change program in advance; the organization must be prepared for unanticipated events; employees are likely to be unnerved; and rarely does there seem to be sufficient time and resources to bring about the needed change. In my view, this description of organizational change in "generic organizations" understates the difficulty of managing change in healthcare organizations. Healthcare managers frequently face additional challenges because (1) they face disparate stakeholder groups, (2) healthcare organizations have multiple missions (e.g., provide healthcare to their communities, remain fiscally s olvent and - frequently - be a primary employer in the community), ( 3) professionals such as physicians and nurses value professional autonomy, and their decisions influence a major portion of healthcare expenditures and (4) the information necessary to manage the change process is often sorely lacking in healthcare organizations. 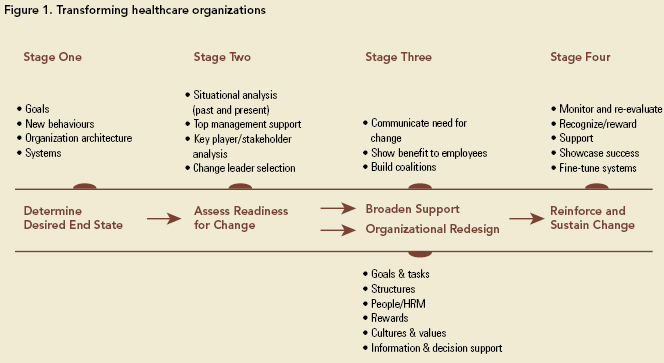 Recognizing important similarities and differences between healthcare organizations and other organizations, I began the development of this four-stage healthcare change framework with a study of change in other industries (cf., Kotter 1996; Tushman and O'Reilly 1997). The goal was to build upon previous observations about managing change - but only to the extent that these observations were appropriate for the healthcare setting. In many cases, fine-tuning, customization and elaboration of these models was necessary so that this paper's four-stage process would be of the greatest value to healthcare managers. This process is described in great detail as a "how-to" manual for change leaders, and is brought to life with illustrations from UHN's implementation of MOE/MAR - one of the most ambitious change initiatives at UHN in years (see sidebar for MOE/MAR description). I take as a given in this article that a leader's initial thoughts about change derive from his or her recognition of a performance gap - the difference between how well the organization is performing and how well the leader wishes it to perform; in short, a performance gap represents the space between current reality and future aspirations. In many cases this gap exists not due to mismanagement, but rather, because strategic or technical opportunities have emerged that allow the organization to do better. Such was the case with MOE/MAR, offering the real opportunity to substantially decrease medication errors and increase patient safety. This opportunity was recognized by UHN's well-regarded Chief Information Officer. Importantly - so that MOE/MAR would be viewed as a safety imperative rather than merely as an interesting Information Technology (IT) project - the opportunity to implement MOE/MAR was also supported by UHN's systems-thinking CEO and by the Board Chair. Both had for years publicly expressed their frustration with the health sector's failure to employ IT to improve performance. Getting to a new desired end state is often appropriately described as a journey, but in large, complex healthcare organizations, the kind of journey during which the weather may change unexpectedly, pot-holes line the route and detours or the occasional road-blocks are confronted. The experienced change leader prepares for this and recognizes that while departures from plan may be necessary, the desired end state is always kept in sight and is clear to all. Many writers refer to this as a vision or "where will we be when we get there," and beginning with the end in mind is critical. However, "vision" can be a nebulous concept without sufficient specificity to be actionable. In the case of UHN's vision for a fully implemented MOE/ MAR initiative, it was necessary to specify measurable goals that would allow it to chart progress and determine success or failure. In my experience, the discipline of developing and monitoring performance measures is critical to focusing the attention of change leaders and those who will be asked (or required) to change. The initial supporters of MOE/MAR, as discussed in "The Benefits of the MOE/MAR Implementation: A Quantitative Approach" (see p. 77 in this issue), had very clear and measurable goals in mind from the start (e.g., reduction in both transcription errors and cycle time from medication order to administration). Also part of their visioning process were initial thoughts about the systems and activities required to measure these outcomes (e.g., chart audits, time and motion studies, electronic reporting from the data warehouse). In addition to specifying measurable goals, other necessary sub-components of vision had to be considered from the onset. For example, what new behaviours, such as navigating a computerized patient record, would clinicians have to perform? What changes to organizational structure and systems would be necessary to support the implementation of MOE/MAR? Answers to these questions about vision can act as touchstones as change leaders confront the numerous decision points that will invariably emerge in the change process. While the specifics of changing behaviours, capabilities, organizational structure and systems are discussed in a later section, for now it is sufficient to emphasize that the outcomes of the visioning process are the building blocks of effective change. At UHN the executive team decided that MOE/MAR would be a priority and that they would support all efforts to ensure it was recognized by those whose daily work would change. Ensuring broad support for this initiative required UHN leaders to conduct a Key-Player (Stakeholder) Analysis. A Key-Player Analysis involves asking the following kinds of questions: Who are the various individuals, clinicians or professional groups and departments likely to be affected by MOE/MAR? Are they likely to be supporters or opponents? What would they want to see MOE/MAR do or not do (i.e., what are their interests)? What will they say they want MOE/MAR to do or not do (i.e., what are their positions)? Who are most able and powerful to enable or scuttle the change? influential: They are influential, either because of their formal position in the organization's hierarchy, the resources they control or due to the respect they have earned. connected: They have strong relationships throughout the organization (not only in a single program, department or professional group) that allow them to efficiently and quickly use their influence. skilled: They have technical, substantive expertise relevant to the change program (e.g., pharmacists who understand how MOE/MAR must function) and are not merely "process people." personal conviction and motivation: They have a strong personal interest in the change program's success. This motivation could be selfish (e.g., MOE/MAR allows physicians to easily take advantage of evidence-based guideline information) and/or selfless (e.g., MOE/MAR promises to reduce medication errors). The source of their motivation is irrelevant. a broad range of perspectives: They understand the broad range of technical issues that may arise during the change process and can empathize with the concerns of the different stakeholder groups. high self-confidence: They have the strength to persevere in the face of opposition frequently targeted at change leaders. The attempt to find someone with all of these qualities will no doubt be daunting, but that should not deter the executive team sponsors of the change. While past research suggests how important these qualities are, it does not suggest that there must be a single change leader. Indeed, in the successful implementation of UHN's MOE/MAR initiative, that change was led by multiple change leaders who enlisted an ever-increasing group of supporters. As the articles in this issue show, UHN established a Steering Committee comprised of well-regarded clinical (e.g., physician, nursing and pharmacy) and administrative (e.g., IT, Project Management) leaders, each of whom was well regarded across the organization and respected by his or her most immediate colleagues. This respect had to have been earned previously and maintained throughout the implementation of MOE/MAR. At UHN the case of one Steering Committee member, the Physician-in-Chief, is noteworthy. Everyone involved with MOE/MAR in the early stages recognized that this Chief, as an Executive Team physician leader, had to be seen as a supporter. Unfortunately, he was also renowned for being a computer neophyte (he did not own a computer prior to MOE/MAR). He used this reputation to his advantage, telling his physician colleagues that "if I can do it, so can you." His support was further demonstrated by the role he took introducing members of the MOE/MAR implementation team (e.g., Project Management and IT staff) to physicians across the targeted divisions and asking these physicians to support these team members. Despite supporting MOE/MAR, he also recognized the need to maintain his credibility with physicians. This required showing an appreciation for physician concerns and a willingness to put the brakes on MOE/MAR if necessary. For instance, in a dramatic event, the Chief Medical Resident came to the Physician-in-Chief approximately 10 days into the pilot. The resident convinced him that the pilot was slow, clumsy and had too high an error rate and therefore needed to be shut down. The medical resident warned the Chief that the other physicians in the pilot division (General Internal Medicine) were "fed up with the project and would soon refuse to use it." The Chief, in a bid to maintain his credible support of MOE/MAR and also to avoid the use of a poorly performing system, immediately met with UHN's Chief Information Officer and had the system shut down. As the Chief recalled, the CIO "gulped hard, picked up the phone, and shut the project down." The system remained idle until more redesign and additional testing satisfied the Steering Committee and the medical staff. In a less dramatic case, a group of sceptical users of MOE/MAR became credible supporters. As seen in "Nursing Perspective: Focus on Clinical Best Practices, Patient Safety and Operational Efficiency" (see p. 50 of this issue), many nursing staff members were initially hesitant to alter their tried and true work habits. However, there was a small group of early supporters among the nursing staff who were not only eager to use MOE/MAR, but who also became MOE/MAR "ambassadors" - selling the vision to their peers. These respected colleagues, though not formally designated change leaders, were instrumental to MOE/MAR's success. In both of these illustrations we see that no single member of the Steering Committee, including the influential Physician-in-Chief, could have successfully led the MOE/MAR initia- tive. Rather, the Steering Committee members together, and those they later enlisted, met the change leader criteria listed above and worked to maintain their credibility and influence throughout the implementation. Prior to Stage Three, relatively few in the organization may have been affected by, or even been aware of, the change initiative. Up until this point, much of the change work has been behind the scenes, both enlisting the support of important allies and sizing up the challenge. It is now time for the change to affect others in the organization, and this will occur on two fronts simultaneously - broadening support and organizational redesign. Broadening support is where the change program moves into high gear. While much of the work thus far has been done behind the scenes and often behind a desk, broadening support for a change requires much greater interaction between change leaders and the staff who will be affected. The communication process is central to broadening support. Researchers in healthcare (Shamian-Ellen and Leatt 2002; Shortell 2006) and commercial enterprises (Kotter 1996; Tushman and O'Reilly 1997) have regularly noted the importance of a communication strategy. And, in those organizations where change is most effective, the communication strategy of the change leaders has several common features. First, the change leaders, supported by the Chief Executive, must articulate a consistent message about the change objectives and means. Second, the message is often best communicated using multiple media (e.g., formal presentations, casual conversation, technology demonstrations, e-mail, newsletters). The effectiveness of multiple media to communicate a message has been well documented in other industries, and it may be particularly important in those healthcare organizations operating "24/7," in which it is difficult, if not impossible, to bring all potentially affected staff together at one time. What is the change (e.g., what is MOE/MAR, and how is it similar or different to similar IT initiatives)? Why this change rather than another change or none at all? How will the change affect the work I do? How will it change my relationships and interactions with others? Do I have the skills to do this work, and if not, how will I develop them? Why would I want to support this change (or, why shouldn't I oppose it)? Unlike many failed change efforts in other organizations, communication at UHN was not unidirectional, nor did it always involve presenting an idea as a fait accompli. Rather, communications often took the form of posing questions and joint diagnosis, in which broad objectives were stated by leadership, but plans to operationalize these were open for discussion. This was seen, for example, in the nursing staff's recommendation to create an "electronic whiteboard" (see "Nursing Perspective: Focus on Clinical Best Practices, Patient Safety and Operational Efficiency" at p. 50 in this issue). Of course, management is faced with a dilemma when anxious employees seek answers that management is not yet able to provide. In an earlier study of hospital downsizing during restructuring in the 1990s, I observed two managerial responses to this challenge, but only one that was effective (Change Foundation 1997). In several hospitals, managers themselves did not yet know the specifics of the downsizing process (e.g., "Will 40 or 80 nurses have to be laid off?"). Those managers added to their difficulties by refusing to speak about an issue until they had all of the answers. This often led to increased rumours, thwarting the change leader's efforts to control information about proposed changes. Silence also affected the credibility of change leaders who were thought to be keeping secrets from those individuals who would soon be affected by the changes. A more successful approach to managing the unknown was simply to be honest with employees about the unknowns. For example, in that earlier study one CEO was unable to determine how many nurses were going to be laid off, but he was able to say how the layoffs would be managed once more information about budgets was available to him and his staff. Although affected staff have a great need for information, most will understand that not everything is knowable by senior management. Honesty about the unknown, married with a plan to lessen the uncertainty, can go a long way toward protecting management's credibility. In contrast, those managers who had not yet earned the credibility of their employees exacerbated this problem by not being honest about the unknowns, providing added grist for the rumour mill. Finally, it serves no one to sugar-coat the truth. In the case of MOE/MAR at UHN, the Clinician Informatics staff who supported the project told their clinical colleagues that they would hate MOE/MAR initially, but that their appreciation for what MOE/MAR could do would grow over time. "trialable" and revisable: Changes can be revised and adjusted. divisible: Changes can be implemented in phases. concrete: Changes involve tangible ideas (e.g., a new IT system) rather than abstract ones (e.g., a safety culture). congruent: Changes fit with other initiatives at the organization. marginal: Changes slip in unnoticed. It is difficult to imagine a change initiative characterized by all of these qualities, nor is it necessary that it be so. In the case of MOE/MAR at UHN, and described in later articles in this issue, the Project Management Team piloted MOE/MAR and revised it based on the pilot experience. In addition, MOE/MAR's Steering Committee and Project Management Team translated the abstract, yet familiar concept of improving patient safety to a very concrete IT system. The objectives of MOE/MAR were also congruent with Nursing's patient-centred-care initiative. Inextricably linked to the task of gaining support, which is largely an education and communication strategy, is ensuring that affected staff appreciate the benefits of change and operate in an organizational environment supportive of it. Thus, it is necessary for change leaders to focus on organizational redesign, that is, ensuring that the organization is sufficiently aligned to support the change. goals and tasks: What are we trying to achieve and what new behaviours will staff have to perform? structure: How do we need to be organized? people and human resource management policies: What kinds of staff do we need and what skill set will they need to have? rewards: What do staff value and get from their work? information and decision support: Do staff have sufficient access to information to do their work and make necessary decisions? There are five important ideas implicit in the Star Model. These are described here, and then illustrated by UHN's efforts to implement MOE/MAR. Second is the proposition that there is no one best way to design a system. Thus, we should avoid asking questions such as "What is the right reward system?" or "What is the right human resource mix?" The answer to these questions is always the same - "it depends." Specifically, it depends on what were the previous subsystem design decisions relating to goals, human resources, structure, etc. For example, in response to a failure to recruit sufficient numbers of anesthesiologists (a human resource issue), a hospital may need to organize around nurse anesthetists (a structure decision), regulations permitting. A third key feature in the Star Model is its dynamism, and specifically, the notion that change to any one of the points on the star may create the need to alter other systems (e.g., reward systems) in order to regain alignment. For example, the structural change from program based to disease-management based may create the need to alter information and decision support systems so that performance can be validly evaluated and rewarded (i.e., so that clinical leaders and administrators can be held accountable). The enhanced information and decision support systems may require better skilled staff (i.e., a change in human resources) who can manipulate and use newly available data. A fourth idea embedded in the Star Model is that there are no levers available to healthcare leaders that, when pulled, directly affect a system's culture and values. Rather, a system's culture and values can only be changed indirectly, and only through the decisions we make about the points on the star. For example, the recently enacted Accountability Agreements between Ontario hospitals and the provincial government are intended to change the rewards to hospitals and their leaders. Although less explicit, they are also intended to change the culture of healthcare in the province to a culture of collabora- tion, performance and integration. Fifth, and related, is the more subtle message that culture and values can either impede change or support it. Thus, when we hear such statements as "We can't do that" (e.g., pay for performance; dismiss low performing staff), there is a very real chance that what is actually being said is "We don't want to do that" or "That's not the way we do things here." On the other hand, the case of MOE/MAR at UHN reveals how organizational culture, namely, a shared commitment to enhancing patient safety, can support change. 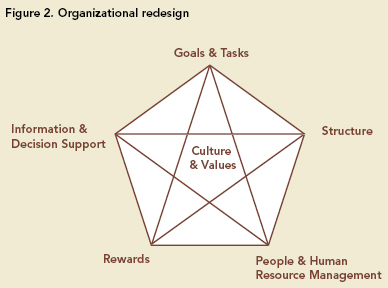 The Star Model simultaneously captures what Ghoshal and Bartlett (1997) refer to as the anatomy (structure), the physiology (systems) and the psychology (culture) of the organization. Now, having described the Star Model at a high level, we can see how some organizational redesign was necessary in order to implement MOE/MAR at UHN. With respect to goals and tasks, the objective was clear: The supra-goal was greater patient safety at UHN, and this would be operationalized by way of 100% utilization of the MOE/MAR system in the targeted units. Structural changes have included the creation of temporary or more permanent teams, new departments or integrating mechanisms (e.g., boundary-spanning individuals charged with linking different functions or units within the organization). As mentioned above, UHN established a temporary Steering Committee to oversee MOE/MAR. In addition, the Pharmacy Informatics Team was created in recognition of the increased demands placed upon Pharmacy as a result of MOE/ MAR. MOE/MAR has also created the need for other standing multidisciplinary corporate committees. Given the goal of implementing a system that cuts across clinician groups, such structural changes were necessary. People and human resource management required numerous changes. Most basic was the selection of appropriate change leaders to support the teams and committees just discussed. In addition, substantial training and skill development were required to work in a MOE/MAR environment (i.e., to be aligned with the tasks). As "Nursing Perspective: Focus on Clinical Best Practices, Patient Safety and Operational Efficiency" reports (see p. 50 in this issue), the demographic profile of UHN nurses is such that many had little experience (and comfort) with computers; substantial training was required to address this skill-gap. With one exception, little more likely needs to be said about the information and decision support dimension; MOE/MAR, by its very nature, represents a change to this organizational design element. However, in addition to the introduction of the MOE/MAR system, UHN also developed clear metrics and measurement systems to monitor the use of MOE/MAR and the impact it had on the organization (e.g., reduction in medication administration errors). These are discussed extensively in "The Benefits of the MOE/MAR Implementation: A Quantitative Approach" (see p. 77 in this issue). Perhaps the most challenging redesign issue in change initi- atives such as UHN's introduction of MOE/MAR concerns rewards, and for this reason, extra attention is devoted here to this challenge. As experienced managers well know, in any change effort there is a very real risk that intended change recipients will become change resistors. Thus, once staff are confident that they will be able to implement the change (e.g., they receive appropriate training, sufficient resources and necessary information), they must also be motivated to change. This requires change leaders to address the issue of benefit - benefit to patients, to the organization, to the health system and to clinicians and administrators. Experienced managers know they can ask their staff to accept personal sacrifices for the good of the organization for only so long. Ultimately, what is good for the organization (e.g., the implementation of MOE/MAR) must also have either a neutral or a positive effect on those who must change. It would be naïve to think otherwise. Yet, this does not present an insurmountable problem. In one sense, healthcare leaders are more fortunate than leaders in commercial enterprises; the core mission of non-profit healthcare organizations is universally regarded as worthy. Thus, leaders must design a change plan - and communicate it clearly - so that the targeted staff will understand that they will be better off (or at least not worse off) if they support the change; alternatively, the staff must realize that they will be worse off if they oppose it. In some cases, the message is a simple one; for example: "As clinicians, you care about the safety of your patients, and MOE/MAR is a safety measure you can use with only little inconvenience." The support for such a claim may come from a variety of sources such as published articles, testimonials from respected clinical colleagues at other organizations or vendors. Critical here is providing support for staff to learn themselves about the benefits of the change, if they wish, rather than simply accepting the word of the change leaders. In other cases, those targeted to change will not be better off with the change; the benefits may flow entirely to the organization (e.g., greater efficiency) or to patients (e.g., more convenience). What are change leaders to do in such cases? Unfortunately, these instances require the judicious use of power. At some point, clinical leaders may need to say "If you want to practise in our hospital, you will use the MOE/MAR system." Such was the case at UHN when a physician leader, who had been asked by his Chief to support MOE/MAR implementation in his division, was instead thought to have organized his colleagues against it. The division head was told that he would be removed from his position if there were any evidence that he was not supporting MOE/MAR. In this case, the respected Chief needed to use his formal power to change the benefit equation for the division head. Change by fiat is never desirable and is frequently unsustainable, as some clever clinicians and administrators will do all they can to resist the change when it is contrary to their interests. Thus, it is critical that change leaders (1) have the ability to reward those who support the change initiative and to punish (or withhold rewards from) resistors or (2) are able to communicate to those impacted by the change how both they and the organization (or patients) will be better off after the change. Obviously, the work behind Stage Three activities can be enormous. In the case of UHN and MOE/MAR, for example, substantial time and resource commitments of senior and mid- level managers were made over four years. These activities are documented in great detail throughout this issue. As will become apparent, these activities and commitments were instrumental in ensuring that (1) there was a broad-based will (deep and wide) throughout the UHN to implement MOE/MAR, and that (2) the organization was appropriately aligned to allow the motivated to accomplish their objectives. Stage Four activities, discussed next, are necessary to take a change program from an experiment to a more permanent way of working. As seen in "The Benefits of the MOE/MAR Implementation: A Quantitative Approach" (see p. 77 in this issue), UHN devoted considerable attention to determining whether MOE/MAR has been living up to its promise. Among other things, UHN currently measures transcription errors (reduced), medication incident reporting (increased) and medication processing time (reduced). In addition, division leaders must ensure that their staff are using MOE/MAR as intended. Performance monitoring allows the organization to make technical adjustments to the system and also to identify where some additional organiza- tional realignment may be necessary (e.g., additional training). In addition, this is the time when the promised benefits of MOE/MAR (e.g., error reduction) must be revealed to those who have thus far borne the cost of change. That is, this is the time to ensure that those who supported the change have been appropriately rewarded for their support. In the case of UHN, the hospital made certain to showcase and celebrate its successes, provide credit where credit was due and acknowledge the sacrifices that staff made. For instance, UHN clinicians and administrators have regularly spoken about MOE/MAR at professional conferences and other organizations. Internally, shortly after the successful implementation of MOE/ MAR at each hospital site (UHN is made up of three hospitals), UHN threw a celebration party for front-line clinicians, project team members and senior executives, thanking staff for their support (see sidebar for MOE/MAR-TINI recipe). The cost of such celebrations pales in comparison to the costs UHN would have paid had MOE/MAR been unsuccessful. By doing so, this appreciation not only reinforces ongoing staff behaviours but also further establishes UHN's leadership's credibility - critical to the next change UHN will ask of its staff. Stage Four is also the time to reflect on both the change process (e.g., Should we have imple- mented MOE/MAR differently? More quickly? With fewer or greater resources?) and the change itself (e.g., Was MOE/ MAR the right change for us to reduce errors? Have new technologies or systems emerged that would have allowed us to better achieve our goals?). This opportunity to reflect should not be lost, despite how eager staff may be to regain some normalcy in their work. Indeed, one of the motiva- tions for each of the articles in this issue was the opportunity to systematically reflect about MOE/MAR and the implementation process. Lessons that emerge from this, concerning both what was done well and poorly, are intended to inform future changes at UHN and other interested healthcare organizations. In martini mixer add ice, syrup and pineapple juice. Shake and serve. Garnish with a single raspberry in the bottom of the glass. Ambrose (1987) presents a slightly different, but certainly complementary perspective on managing the kind of complex change seen in the case of UHN's MOE/MAR implementa- tion (see Figure 3). 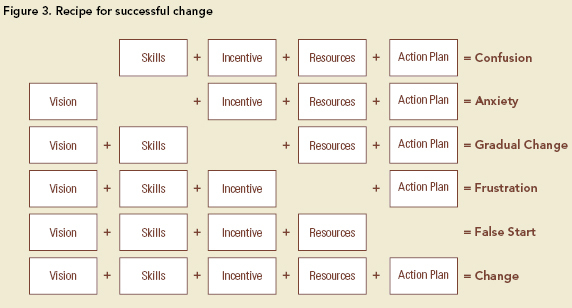 His recipe for successful change identifies five critical elements to the change process (vision, skills, incentives, resources, action plan), each of which has been addressed in the Four-Stage model described in this article. In addition, his framework - by revealing predictable outcomes when ingredients are missing - is a helpful diagnostic tool to determine why the change process has not yet been successful. One of Ambrose's requirements for successful change is action planning - the primary focus of this article. To assist readers, Figure 4 provides a template for finding order among the clutter of organizational change. This template comes with a warning, however. Paradoxically, the most effective change leaders do not "overplan," recognizing that many unanticipated events await them. Effective action planning involves laying out the likely sequencing of events, attempting to stick to a timeline and doing so to the best of one's ability. As Kotter (1996) has argued, change leaders must accept that the sequencing of events and completion of all stages in the change process may be far more important that sticking to a preset timeline. Finally, as readers will see either by on their own change management experiences or by reading the articles in this issue, successful change programs are much like icebergs. As the passengers on the Titanic unfortunately discovered, it is the 90% of the iceberg below the surface of the sea that sinks the ship. To avoid the sinking of a change program as complex as UHN's MOE/MAR program, change leaders must give the needed attention to all those activities that are seen by few, but which are critical to smooth sailing. Ambrose, D. 1987. Managing Complex Change. Pittsburgh: The Enterprise Grp Ltd.
Change Foundation. 1997. Leading the Management of Change. Toronto, ON: The Change Foundation. Drucker, P.F. 1993. The New Realities. New York: Harper & Row. Gale, A., ed. 2005. CPOE Digest 2005. Orem, Utah: KLAS Enterprises. Ghoshal, S. and C. Bartlett. 1997. The Individualized Corporation. New York: Harper-Collins. Golden, B.R. and R.L. Martin. 2004. "Aligning the Stars: Using Systems Thinking to (Re)Design Canadian Healthcare." Healthcare Quarterly 4: 34-42. Shamian-Ellen, M. and P. Leatt. 2002. "Emotional Intelligence - How Well Do We Know Ourselves and How We Relate to Others?" Healthcare Quarterly 6(1): 36-41. Shortell, S.M. 2006. Health Care Management. Albany: Delmar Thompson Learning. Tushman, M.L. and C.A. O'Reilly. 1997. Winning Through Innovation. Boston: Harvard Business School Press. 1. Parts of this article draw on the report "Leading the Management of Change: A Study of 12 Ontario Hospitals," which I authored with Murray Bryant, Ann Frost, Ken Hardy and Peter Newson for The Change Foundation (Change Foundation 1997).